Football, so I’m told, is a game of two halves. 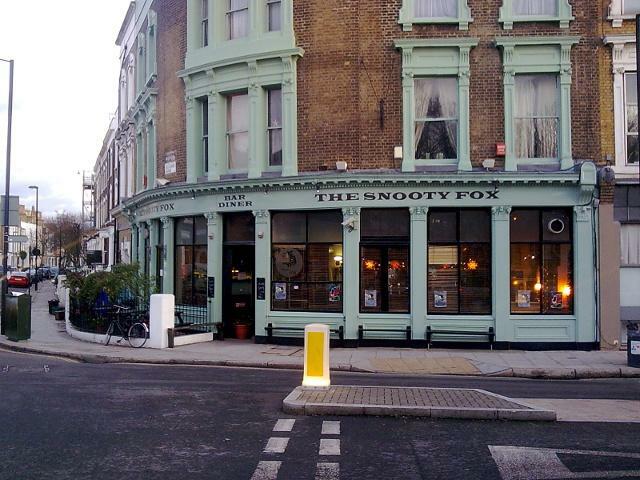 The Snooty Fox, in my eyes, is a pub of two halves. Directly opposite Canonbury Overground station this pub is in an area which is well on its way to being gentrified and the clientele of the pub strongly echoes this. On my visit Oxbridge types had made a pilgrimage here to watch the rugger and their well turned out ‘skirt’ milled around clutching G+Ts and bags which probably cost more than most people’s mortgage payments. All a bit posh but very good natured and bustling; pretty much exactly what you want from a pub on a Saturday afternoon. Behind the bar eager staff pulled pints from an impressive selection of guest ales and unusual lagers which I’m reliably informed are changed on a regular basis so you’d not be bored on a return trip. Decor is what you might term as ‘retro chic’ with a very authentic looking jukebox taking centre stage adjacent to the DJ booth and walls plastered with portraits of people who are richer and more famous than you will ever be. Seating is ample and in the form of long benches and tables lending to the atmosphere of friendly camaraderie between pint quaffing strangers. It’s softly lit and the jazzy lampshades above the bar itself are a marvellously eye catching feature. So….that’s the good half and it is very good. An interesting thing happened though when we sat down. My companion sat facing the rugby and saw all of the above in his eye line. Given that I have less interest in rugby than an Inuit has in Nicolas Lyndhurst I faced the other way and was took in a very different scene. With the noise of banter ringing in my ears I gazed upon a rather odd and disappointing scene. Like most half decent pubs The Snooty Fox does food; from the look of it the food is probably pretty good too. However I like to maintain a healthy level of ignorance about how and where food has been prepared; I harbour less desire to observe the inner workings of the pub kitchen than I do to see one of my loved ones being autopsied. The Snooty Fox unfortunately is lumbered with an open kitchen which is surrounded by ghastly brickwork. It looks a little bit like a burger van drove through the wall one night and rather than bother to get it removed they just redecorated around it. Whilst I’m sure hygiene standards are high I winced slightly at the rolls of cling film and tin foil atop a microwave and assorted Tupperware items strewn around the shelves. This isn’t the Fat Duck and I’m not watching artisans practice their craft; two blokes spit roasting a chicken is something I don’t want to see in this setting…actually I never want to see that. ‘At the end of the day when your back is against the wall you’ve got to do what you’ve got to do.’ – Football Mantra. What I’ve got to do is give this pub credit where it’s due. The first half is totally excellent and is a thoroughly enjoyable place to be with enough beers to keep even me happy for a whole afternoons boozing. But it looses out on a higher rating because the second half is rubbish. Give it a go, get a seat looking the right way and try and ignore the sounds of men doing things to poultry.